In a large bowl, stir together zest, chili powder, and sea salt. Add shrimp to bowl with spice mixture and toss until well coated. Cover and refrigerate, at least 30 minutes. 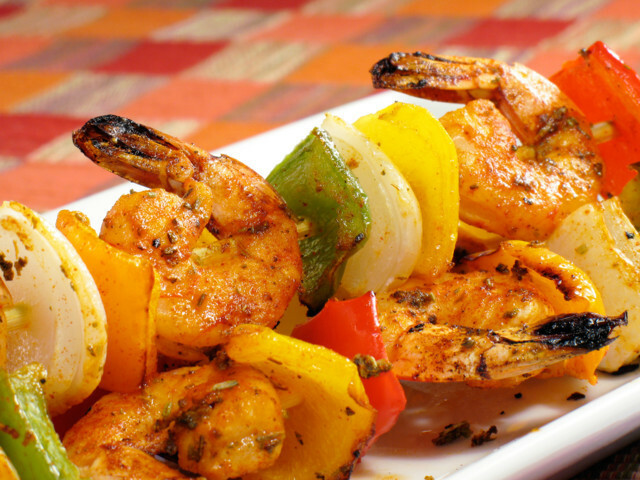 Alternately thread shrimp, citrus wedges, and peppers on 12 (10-inch) skewers (there should be several per skewer). Place the skewers on grill. Grill, turning occasionally, until shrimp are pink and peppers are slightly charred (3-5 minutes). Transfer skewers to serving platter. Serve shrimp with romesco sauce.